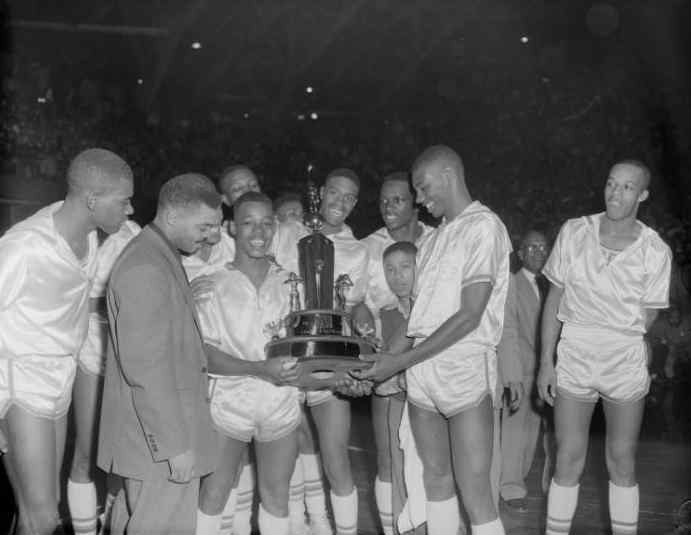 On March 19, 1955, the Tigers of Crispus Attucks High School defeated the Roosevelt Panthers of Gary, Indiana, earning the capital city its first state high school boys basketball championship. On a national level, the victory marked the first time an all-black team won an open state tournament. 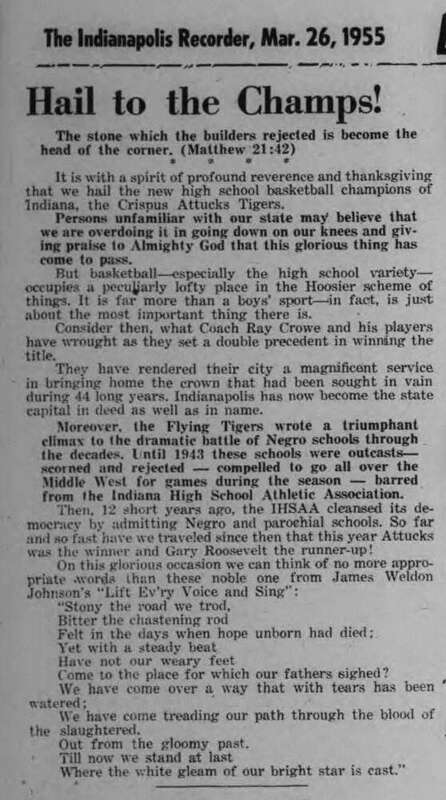 As the Indianapolis Recorder noted at the time, “so far and so fast have we traveled since [black schools were permitted to compete]…that this year Attucks was the winner and Gary Roosevelt [another all-black school] the runner-up!” The championship game, played in the Butler Fieldhouse, was also notable for the number of records broken. Among these were the highest combined game score in the state championship (171), highest score winning team (97), highest score losing team (74), most field goals both teams (63), and most free throws both teams (45). A victory to savor it was, and perhaps the beginning of the end of one important form of racial division. Yet even the moment of city-wide unity was tarnished when city officials decided to reroute the victory parade. Instead of an extended stop on Monument Circle for celebration and photos as previous champions had enjoyed, the Attucks Tigers were allowed to circle the monument once and proceed to Northwestern Park, far from the city center. Crispus Attucks High School had opened in 1927 with an enrollment of 1350 African American students. Although elementary schools in Indianapolis were segregated, there were no separate high schools for blacks until 1925 when the city’s school board, under pressure from white organizations, voted to appropriate funds for construction of one. The National Association for the Advancement of Colored People’s legal suit to stop the building failed, and Crispus Attucks opened in 1927. It quickly became a cultural pillar of the black community and was noted for its academically impressive faculty, African American education professionals who had been recruited from across the country. When the school opened, it did not have a gymnasium, and its sports teams would not be allowed to join the Indiana High School Athletic Association (IHSAA) until 1942 when wartime pressure to desegregate compelled an opening. Prior to IHSAA admittance, the team traveled around the state to play against other all-black basketball teams, often being denied hotel and restaurant services. In 1950, Ray Crowe became the Tigers coach. 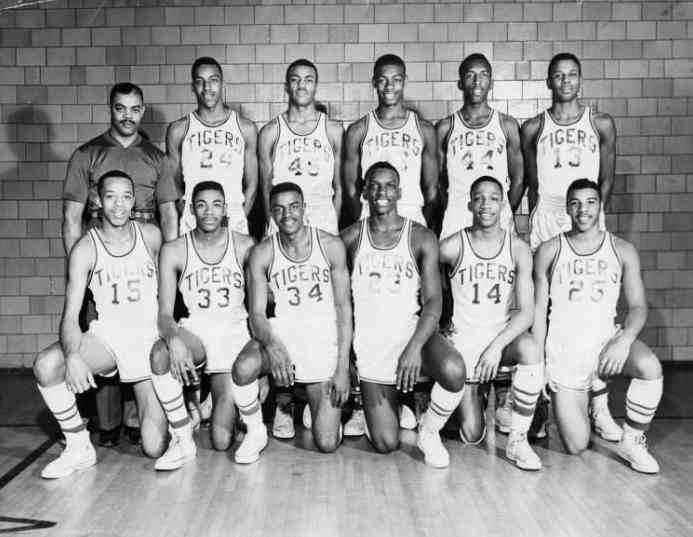 With his guidance and talented players like future NBA star Oscar Robertson, the Tigers not only won the 1955 championship, but went on to have an undefeated season and earn a second championship title in 1956. With Crowe as athletic director and Bill Garrett, the first African American to play for Indiana University, as coach, the Tigers were state champions again in 1959. After 1949, when the state banned official segregation, some Crispus Attucks students applied to other institutions, though the school remained segregated until 1971 when the U.S. District Court ordered an immediate desegregation of Crispus Attucks and what had become other single-race Indianapolis schools. For more on this topic, check out our Crispus Attucks High School entry! Oscar Robertson: For the second year in a row, Crispus Attucks won the High School Basketball State Championship, crowning their undefeated season of 31 games. 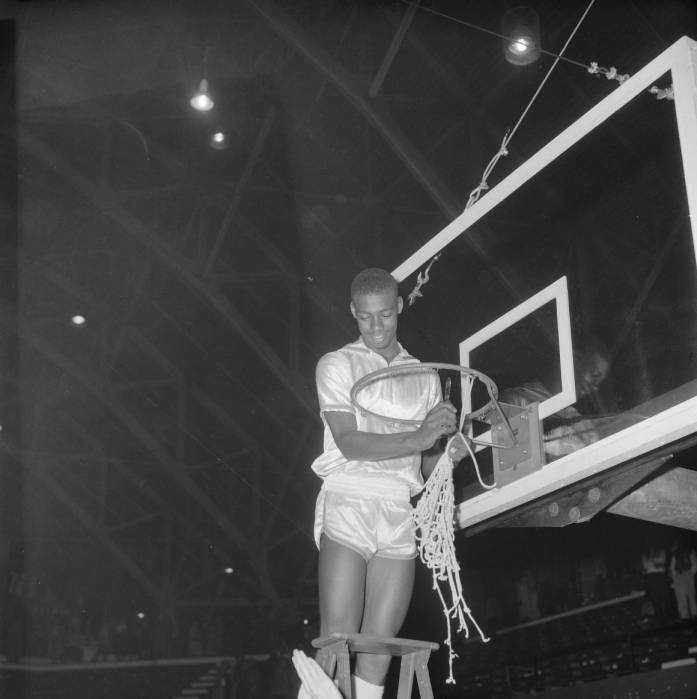 Here, Oscar Robertson, cuts down the basketball net from the winning game as a souvenir. Photo Courtesy of Indiana Historical Society. 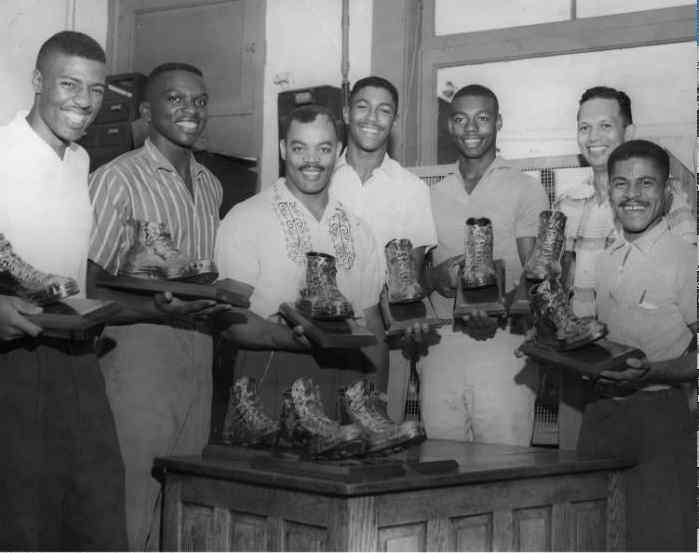 John Dichtl, “The Crispus Attucks High School Tigers ,” Discover Indiana, accessed April 25, 2019, https://publichistory.iupui.edu/items/show/43. 1928 Crispus Attucks High School Yearbook. Crispus Attucks Museum Collection. 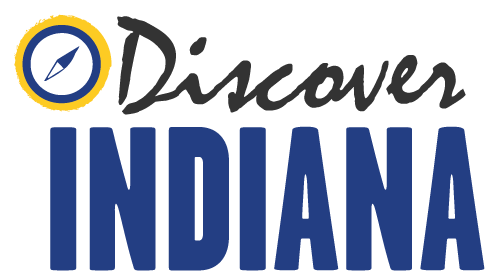 IUPUI Program of Digital Scholarship, http://indiamond6.ulib.iupui.edu/cdm/ref/collection./CAttucks/id/699. Published on Feb 21, 2014. Last updated on Apr 2, 2019.